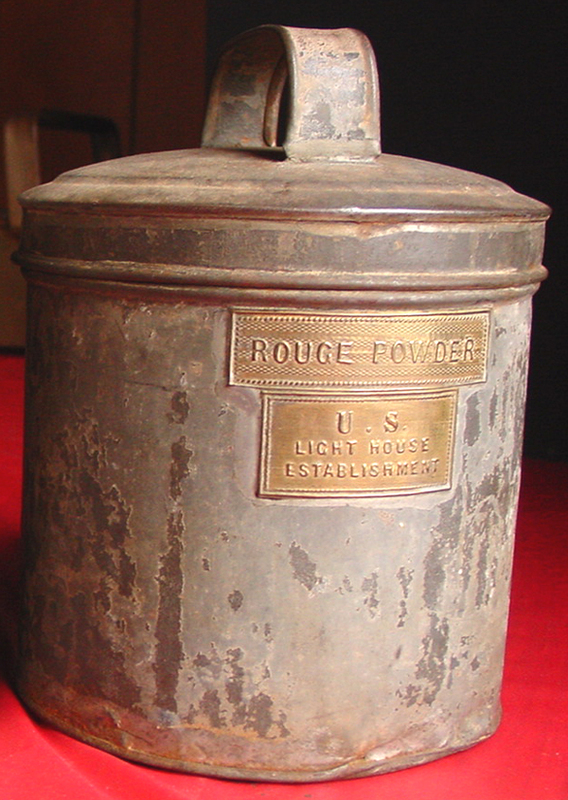 Lighthouse Establishment rouge powder storage container. 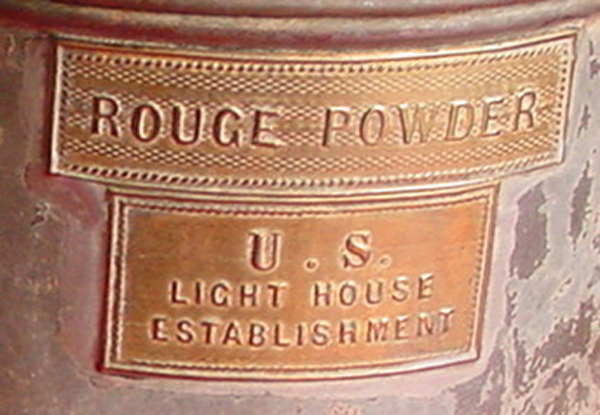 Two tags located here with the words "Rouge Powder" stamped into it and "US Lighthouse Establishment" mark this storage container. This can was probably purchased from an outside vendor and then marked after the lighthouse service purchased it. 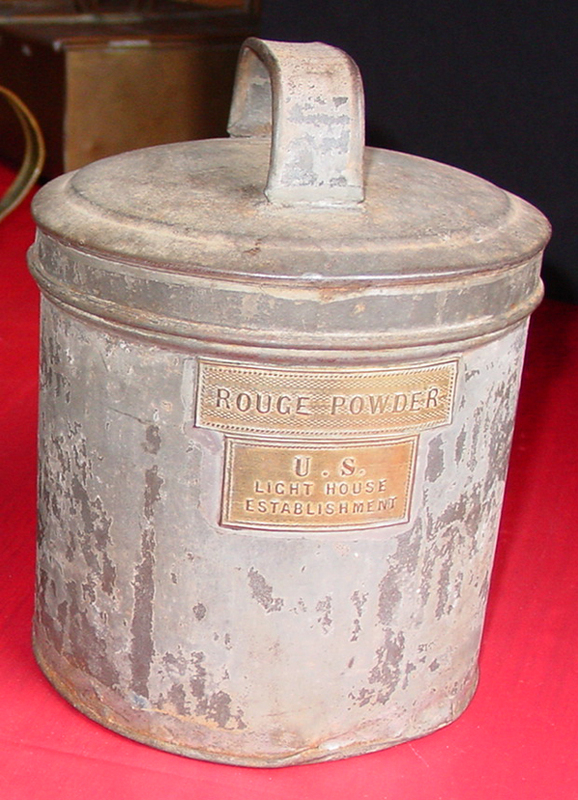 The rouge pwder storage container was used to store raw rouge in which was used in polishing brassware. It was sometimes transferred to a smaller brass storage can and that can was stored in the keepers service basket. The service basket was used to hold rags, store the rouge can in and scissors for example for trimming the lighthouse oil lamp wicks. 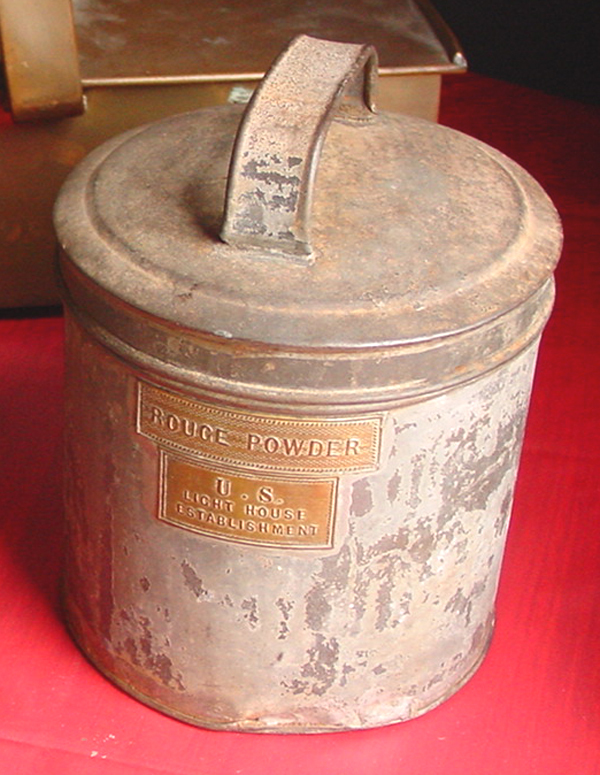 These containers were designed to keep the rouge powder ready for use. We are looking into the use of the rouge powder right now and will post more when we learn other uses it had. These containers were made out of galvanized medal and then had the lighthouse plates soldered onto them to indicate they were for lighthouse use. As with all objects in the lighthouse service, it was marked with a US Lighthouse Establishment plate that was soldered onto the piece indicating it was probably purchased from an outside vendor. These containers were one of the few items that the lighthouse service purchased from outside vendors as they made most everything they needed. A better photo showing the top of the can.